Question: Is Christian Meditation New Age? Answer: Although on the surface Christian Meditation might appear to be New Age, it is not. New Age philosophy does not honor the One and Only Living God which is Jesus Christ. 2 Timothy 3:15 tell us that there are those who have a form of godliness but deny or don’t attribute this power to the true God, from such we are to turn away. During Christian Meditation, we’re not meditating on some unknown deity or the cosmos. Instead, we are meditating on God’s Word and His Power, Glory, and Presence. We use this time to enter into God’s presence and to fellowship with Him in Spirit. If you are meditating on a scripture, it will help you to hide God’s word in your heart and bring your mind under the authority of Jesus Christ. There are many forms of meditation. Some have religious principles, others are purely secular. 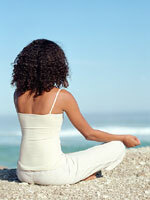 You can choose which type of meditation you do based upon your desired outcomes.